Exponential debt increases coupled with limited natural resources mean that we are in a predicament. This is the message The Crash Course Author Chris Martenson delivered at the Casey Research/Sprott Inc. summit, "When Money Dies." As an economic researcher, Chris considers the "Three E's" that shape our future: Economy, Energy and the Environment. In the below presentation, "Unfixable," Chris explains to Energy Report readers why these indicators suggest a global economic slowdown. Read on. The next 20 years are going to be completely unlike the last two decades. How the world works, how stocks grow, the very nature of investing and how our economy functions—all of these are due for fundamental, earth-shaking change. As investors, we have to adjust the way we look at the world. We want growth. We need economic growth. It's all you hear about when the treasury secretary talks about how we are going to get the economy growing again or when the president talks about jobs. When our money system is growing, things are reasonably happy. When it is not growing, things are very unhappy. As long as everything is growing, our economy functions reasonably well. And when it stops growing, it throws giant fits and gets into trouble. That is why we are always chasing growth. And there is a reason for that: Money. But what is money? I don't care what color it is or whose picture is on it or what counterfeiting measures you have in place. All money in the world today shares one characteristic: it is loaned into existence. It seems like a simple enough statement, but this has enormous implications. Because it is borrowed, we pay interest on it. That interest drives a peculiar feature in our money system (by "our" I'm referring to all fiat currencies in the world because all of them operate by this same loaning principle). When you loan money into existence, you have to pay both the principal and the interest back. That means there is always more debt than money in the system. We are constantly growing our money supply because our population is growing. In the past, we had a seemingly endless supply of resources, energy and land to occupy—all of that has been OK. But we are coming to a point where it's not OK anymore. Consider a chart of total credit market debt. It tops out at about $52 trillion (T). Each of those big, blue, upside-down triangles mark a doubling of credit market debt. 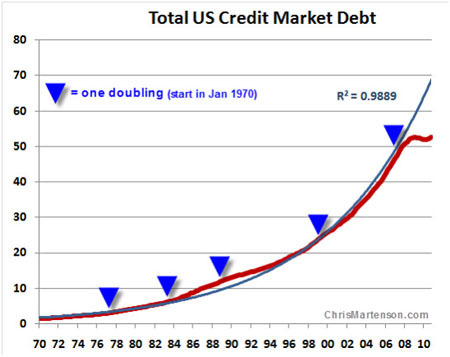 From 1970 to about 1977, total credit market debt doubled. It doubled again by 1983. Then it doubled again and again and again. Over four decades, we had five doublings of our credit market debt. In order for the next 20 years to look like the last 20 years, we would need two complete doublings of credit market debt. Let me put those numbers in: $52T to $104T to $208T. That is an absolutely obscene amount of credit growth. This is not how our economy is supposed to function. It was a result of the abandonment of the gold standard, and it is not sustainable. The second thing I want to point out is the blue line. That is a curve fit. It is an attempt to mathematically model what is going on with that red credit market debt line. It shows that our money system, our credit system, has been growing nearly perfectly exponentially. Another way to evaluate the economy is by looking at the debt:GDP ratio, because if you have a lot of income, it is OK to have a lot of debt: GDP is our income. Something really unusual is happening: The ratio is skyrocketing in an unprecedented range, with the exception of a blip during the Great Depression when manufacturing dived. We are in the middle of a very interesting experiment in this country. We can't dig through the data series and say, "Oh, the last time we did that, this is how it turned out." We don't have any historical examples of any country in history getting out from under a debt:GDP load this high without going through some kind of a massive currency adjustment. There is one example from 1815 to 1900 where England got out from under 260% debt:GDP load, and it did that by cutting war spending after the Napoleonic Wars with help from the Industrial Revolution. Nothing on our horizon indicates that we are going to cut spending or increase our overall economic output by huge amounts. So we have to ask the question: How do we get out from under that? This debt:GDP imbalance is a global phenomenon. It is not just a U.S. problem. That is why the economy must grow. In order to be happy, in order to service those debt loads, it must grow. Exponential growth, the kind that starts out nice and easy in a linear fashion and then shoots up suddenly, is what I am really worried about. It is everywhere. Human population grew rather sedately for a long period of time and, recently really accelerated. Oil consumption has increased on the same model. Starting in the early 1940s, it really turned up. The more we produce, the more we use. The same is true on the environmental side; water use, forest loss, species extinction, fisheries exploited—all of this turned up aggressively in in the 1940s and 1950s. We could look at miles of roads paved, numbers of McDonald's hamburgers served; it doesn't matter. We are surrounded by all of these nonlinear, very J-shaped curves. This is really critical if you believe in boundaries. There is only so much arable land. There is a limit to how much water is in an aquifer. There is a limit to how much oil is in the ground. We can argue about whether we are close to those limits, but we can't argue about the fact that the limits exist. So we need to understand how we are using these things. I like to use a thought exercise to explain exponential growth. I have this magic eyedropper. A drop of water from this thing is going to double every minute. So one drop will become two drops in one minute. In another minute it will be four drops. After about six minutes, it will be enough to fill a thimble. If we started this experiment at noon on the pitcher's mound of Yankee Stadium and you are handcuffed to the highest row of the bleacher seats, how long would you have to escape from your handcuffs? By 12:50 that same day, the park would be completely overrun with water. In fact, at 12:45 this is still 97% empty space with a little water in the infield. You have 45 minutes to sort of fool around, but the next five minutes are critical. That is the power of exponential increases. If you have that sense that world events are speeding up, you are right. They absolutely are. Dating back three million years from the australopithecine humanoid precursors to 1960, we put 3 billion people on the planet. It took 40 years for the next 3 billion to arrive. Someone who is 22 years old today has been alive when half of all the oil in the world that has ever been burned has been burned. We are burning oil at roughly 2–3% more per year than when we were in a healthy economy. This is a predicament. Do you know the difference between a problem and a predicament? A problem has solutions. A predicament has inevitable outcomes that have to be managed. If you are in a predicament seeking solutions, you are wasting time. A lot of our efforts at the national level right now are centered around seeking solutions to predicaments. That concerns me greatly because it means we are actually wasting our time, wasting resources and not looking at things the right way. Our predicament right now concerns energy. U.S. oil production peaked in 1970 and has never returned to its former days of glory—and it never will. As a result, we import two-thirds of our liquid petroleum needs to run our society. No matter how much we drill at this point, there is absolutely no chance that we are going to return to our former production highs. In fact, out of the 54 oil-producing countries, we have about 45 that have gone past peak. No country has ever managed to get back to a former peak and exceed it. The peak year for oil discover was 1964. 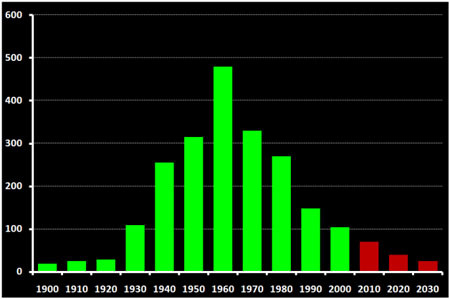 The green in the chart represents history. The red is projections for what we think we might find going forward. There could be some wiggle room, but I think it would be a stretch to think that we are ever going to get back to that peak that we saw in the 1960s. Here is the thing about oil: If you want to produce it, you have to find it. Our finds were 40 years ago. Interesting fact: The U.S. peaked in its domestic discoveries in 1930 and hit a production peak in 1970, a 40-year gap. World oil discovery peaked in 1964 and world oil production for conventional oil peaked in 2005, 41 years after its find peak. It has not yet been exceeded. It might, but it hasn't, even though oil prices have tripled. If there is ever an incentive to get your oil out of the ground, it's when prices triple. That's what market theory tells us. Somehow, we haven't done it. The U.S. Energy Information Administration issued a shocking statement in its 2008 World Energy Outlook. It said that oil from currently producing fields peaked in 2006. It factored in natural gas, non-conventional oil and crude oil yet to be found and developed as possibilities for filling the country's growing energy needs. The problem is that in order to get energy out of the ground, you have to put energy into the equation. If we take a barrel to find a barrel, then all we are doing is using energy to go explore and get energy out of the ground—there is none left over to go into our gas tanks. There is none left over to grow food, or for anything else. By the time you are using one barrel to find one barrel, you are spinning your wheels. The same lopsided equation is operational in shale beds. If we decide to switch to natural gas, we will need to retrofit our cars, build filling stations and pipelines. This will take a lot of money and about 10 or 20 years to build out. There are going to be companies that make a lot of money aggressively attempting to expand into that, but we are already behind the eight ball. When we first started drilling for oil in the 1930s, we were getting 100:1 returns from these little wooden drilling derricks going down maybe 1,000 ft, hitting spindletop. At that point we were putting in one barrel and getting 100 back. In the '70s, we were getting maybe 25:1 back. In the 1990s, we were getting 18:1 or even 10:1. We were drilling deeper, more remotely. The substance was a little heavier, and more sour. We went after the good stuff first: light, sweet and near the surface. Now, we are drilling in a deep ocean environment. Some of our efforts are down to 3:1. Ethanol will make it even worse. As we fall down this energy cliff and get progressively less and less energy back for our efforts, the amount of energy available to us to run our economy drops rather precipitously. This same dynamic impacts natural resources. Some 150 years ago, we found giant nuggets of copper the size of cars sitting in streambeds. Eventually we went after smaller nuggets. Then we went after copper ore grades of 10%. Now we have huge open-pit mines with ore grades of 0.2%. Regardless of whether copper is $4/lb or $3.50/lb or $35/lb, think about the energy required to take 500 lb of copper ore from the bottom of that pit, haul it up a quarter mile, run it through a crushing machine, smelt and refine it to get that 1 lb of copper out. Would we be doing that if we didn't have liquid fuels, if we didn't have diesel to run big trucks? I think the answer is no. And this is after just 150 years. What happens over the next 150 years? How about in 500 years? If we continue to deplete all of our mineral reserves at 2% growth in extraction per year, which has been our 40-year historical run, how long will they last? We might find more, but sources will be more remote, further away from infrastructure needed to extract them, refine them and move them to market. The end product will be more diluted and lower quality, with deeper costs attached. We have a world where we will face exponentially rising costs if we continue to run our economy in the way it has been running. That is not a great strategy at this point. Our economy must grow by design because of how our money and debt systems operate, but it is connected to an energy system that can't grow. This is the definition of a predicament. No matter what policies we pursue or how clever our technologies get, there are certain things that we just can't undo. When you take oil out of the ground and you burn it, it is gone. And we are burning it up at a faster and faster pace. Coming to terms with this reality has actually been a fairly liberating idea for me. It has allowed me to understand what is important in my life. And it has been very helpful in my overall investing philosophy. Even though it is not a terribly uplifting story for a lot of people at first, I do think that it helps to clarify where we are in the story and what is happening. This was a summary of Chris Martenson's presentation. For the complete audio collection of the Casey Research/Sprott Inc. Summit "When Money Dies," click here. Chris Martenson is a scientist, financial and economic analyst and writer at www.ChrisMartenson.com. He earned his MBA at Cornell University and a Ph.D. from Duke University. As one of the early econobloggers who forecast the housing market collapse and stock market correction years in advance, he launched a video seminar and later published a book entitled The Crash Course. To learn more about Chris and his work, including the Crash Course, go to chrismartenson.com. DISCLOSURE: From time to time, Streetwise Reports LLC and its directors, officers, employees or members of their families, as well as persons interviewed for articles on the site, may have a long or short position in securities mentioned and may make purchases and/or sales of those securities in the open market or otherwise.